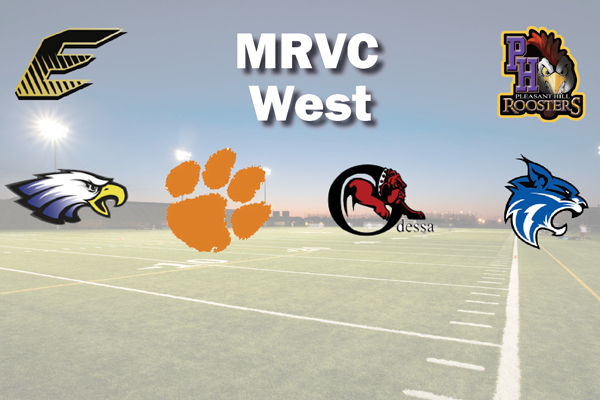 The Missouri River Valley Conference West has long been a conference with good programs and in the last few years the group has raised the bar even higher. Oak Grove won a Class 3 title in 2014 and Odessa played for the Class 3 championship last season. Harrisonville puts up consistent double digit win seasons and Pleasant Hill is just a few seasons removed from an undefeated regular season. This year looks like more of the same. Harrisonville, Oak Grove and Odessa look like teams that can make deep postseason runs while Grain Valley, Excelsior Springs and Pleasant Hill could be improved. Through in solid out of conference schedules for every team and there isn’t a bad game any week of the season. It looks like 2016 should be another strong year MRVC West. Biggest Challenge: Former Kansas City Central coach Mark Faubion has taken over Josh Buford who stepped down at the end of last season. Faubion was on staff last season so the transition has been smooth. The coaching staff is changing its offensive philosophy to a more power running game so gaining that type of mentality is the biggest hurdle for the Tigers. Outlook: Excelsior Springs will be young this season so there are a lot of opportunities for players to compete for starting positions. It’s a tough league slate along with some good non-conference games which will test the Tigers every week. Biggest Challenge: The Eagles will be a little younger this year and one of the more inexperienced areas is the playmakers. Last season the offense had some explosive players while this year Grain Valley may be a bit more on the grind it out side. That along with some early injuries will be the main things the Eagles are focused on heading into the season. Outlook: Grain Valley is settling in its third year under David Allie and this could be a season where they take another step forward. The Eagles have good numbers and seniors who have a good knowledge of what the coaching staff wants to do. It will be a tough schedule for Grain Valley but the arrow should be pointing up for the Eagles. Biggest Challenge: The Wildcats are coming off another dominant season and many good players return. The skill positions have good experience but the both sides of the line are looking for new starters and backups. Outlook: Harrisonville has been the model of reload not rebuild for more than decade. If the guys in the trenches gain some traction this could be another outstanding year with a deep playoff run. Biggest Challenge: The Panthers have a big group of returning starters to go along with a big senior class. Oak Grove also has a big freshmen class so blending the learning of the freshmen with the needs of an experienced group is at the top of the list for coach Pat Richards and his staff. Outlook: Oak Grove wasn’t quite as strong as their state championship season in 2014 but the Panthers still managed to be one of the top Class 3 teams in the Metro. This year there are a lot of starters back along with several players who saw a lot of time due to injuries. The Panthers could again be on a track that takes them deep into the Class 3 postseason. Biggest Challenge: The Bulldogs had their best season in two decades and bring a lot of players back from the state runner-up teams. Odessa lost its starting quarterback, tailback and several defensive backs so replacing those positions is priority one during the preseason. Outlook: Odessa got over the hump in a big way last season and now looks like one of the better programs in Class 3. The Bulldogs will be tested by some great teams in their own conference and will face some stiff competition from the likes of Hogan Prep Academy and Center when the postseason comes around. If Odessa stays healthy and gets some key wins it could be another great year for the Bulldogs. Biggest Challenge: With only three total returning starters there are a lot of holes to fill. Getting the right players in the right spots has been the big task of the summer. There are some good skill players so finding the guys to block will be key for the offense. Outlook: The Roosters make the move back down to Class 3 but the schedule and postseason don’t get much easier. This is the second year for Coach Greg Smith so the learning curve for his players is behind them. If the young players can grow up as the season goes on Pleasant Hill could take a few steps forward.